To understand diabetes, we need to understand how the body processes food. This explanation is a simple overview of the process. When you eat carbohydrate food (sugar, fruit, starchy food, milk, and dairy), it is broken down by the stomach and digestive system into blood sugar or glucose. Glucose is a type of sugar and provides the body energy. The glucose moves into the bloodstream, and the body detects that the blood glucose is rising. In response to that, the pancreas which is an organ that sits below the stomach releases a hormone called insulin. Insulin is a hormone which controls the rate at which carbohydrates, starch, sugar, and other foods are changed into blood sugar (glucose). Insulin helps to maintain the blood glucose level within a normal range. It is insulin that helps the body get the energy from the food we eat. The bloodstream takes the glucose and the insulin to every cell in our body that needs it. For example, let’s take muscle cells, the insulin acts as a key to unlocking the door for the glucose to get into each muscle cell and then the blood glucose level will drop. Once this happens the blood glucose can be topped up by the liver releasing extra blood glucose into the blood system and then the pancreas will release more insulin and again back to the muscle cells to repeat the cycle. The body functions the best at an optimum level. It does not like it when the blood glucose is too high, under normal conditions the body balances out the blood glucose and insulin. However, when the system does not work properly, people develop diabetes. Formerly known as Syndrome X. Metabolic syndrome is the name for a group of risk factors that increases your risk for health problems, such as heart disease, diabetes and stroke. Risk factors include age, race, obesity, other diseases and insulin resistance. Diabetes. Make lifestyle changes to lower your excess weight, otherwise insulin resistance will increase along with your glucose levels. You will develop pre-diabetes then type 2 diabetes. Cardiovascular disease. High cholesterol and high blood pressure can contribute to the buildup of plaques in your arteries. These plaques can narrow and harden your arteries, which can lead to a heart attack or stroke. Insulin dependent diabetes, known as juvenile diabetes, now called type 1 diabetes. Type 1 diabetes affects children and young adults and is distinguished by the pancreas failing to produce insulin. There is no cure and is a mystery as to why it happens to some people and not others. Type 1 diabetes occurs in about 10 % of all cases in the world. Diabulimia (also known as Eating Disorder – Diabetes Melletius Type 1 ED-DMT1) is an eating disorder. Similar to anorexia nervosa, bulimia nervosa and even binge eating disorder. The link between type 1 diabetes and the eating disorders is the unhealthy practice of withholding insulin to manipulate or lose weight. fatigued and irritable. If the person is lucky enough to survive, the long term effects include diabetic ketoacidosis, heart attack, nerve damage, blindness, liver, and kidney damage . Type 2 diabetes occurs later in an adult’s life. Characterized by the pancreas being unable to produce enough insulin, or cannot use it effectively, then a high amount of glucose builds up in the blood. Unchecked, type 2 diabetes with high glucose levels lead to heart disease, stroke, blindness, kidney failure, and amputation of toe(s), feet(s), or leg(s). Type 2 diabetes occurs in about 90 % of all cases in the world. 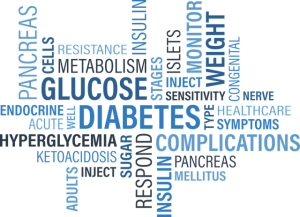 Type 2 diabetes is also known as insulin resistance and will be the main topic of discussion on this website. Gestational diabetes occurs in 3 % of women during pregnancy and disappears after delivery 3 weeks later. Estimated, half of these women are prone to developing type 2 diabetes. Frequent thirst and urination – When the blood glucose is high the kidneys cannot absorb all of the sugar, instead, it is dumped into the urine and is flushed out into the urine which produces more urine. The increased urine production causes thirst and dehydration. The dehydration causes dry, scaly, or itchy skin and thrush (genital itching). Blurred vision – High blood sugar causes the lens in the eye to become cloudy and swollen. Lowering the blood sugar to a target range of 80 mg/dL to 140 will help relieve the situation. If you have blurred vision, you must contact your doctor or eye specialist immediately. A long-term complication of diabetes that affects the eye is diabetic retinopathy. Slow healing wounds – Diabetes decreases the proper circulation of blood flow, so injuries heal slowly. Blood glucose is too high. There may be numbness in the hands and feet. Bumps and bruises on the body may go unnoticed. Tingling or numbness – In your legs is a long-term complication of diabetes, high glucose can damage nerves in the legs or feet. The longer you have diabetes, the higher the risk of diabetic peripheral neuropathy. Increased hunger – Why do you get hungry with high blood sugar? High blood sugar causes hunger. Cells rely on insulin to get glucose from the blood. If insulin is not enough, glucose backs up and cannot get into cells. Cells signal the brain for more carbohydrate food. No energy – The blood sugar level is too high or too low. It is due to an imbalance between glucose and the circulating insulin. Sudden weight loss – The insulin cannot process glucose into the cells to use as energy. When this occurs, the body starts burning fat and muscle for energy. If there is a reduction in body weight of 5 %, consult a doctor. This is common prior, to type 1 diabetes, but also later, in type 2 diabetes. Cramps – In the hands, legs, or calf muscle, an unbelievable pain, waking in the night while sleeping or anytime. You must massage immediately. Memory loss – Forgetting what you did the day, week or month before. The blood sugar level is too high in your system causing your brain to not function properly. There is a link to Alzheimers disease. The number of people that have diabetes is beyond belief and is past epidemic proportions. In the old days, diabetes was rare. Now the disease is very common. The processed food phenomenon has changed the scene of healthy eating, to unhealthy eating, leading to type 2 diabetes and other related diseases. Statistics from the Who and IDF. It is estimated that 1 in 7 people in the world have diabetes, which means about 1 billion people. As of March 2018 the numbers from the American Diabetes Association in the US. The estimated total economic cost of diagnosed diabetes in 2017 is $327 billion, a 26% increase from our previous estimate of $245 billion (in 2012 dollars). 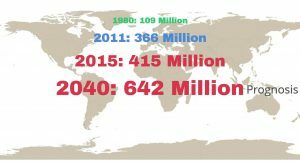 2016: $673 billion dollars – 12 % of Global health Expenditures. These estimates are from the WHO 2040: Guestimate is $1.5 trillion dollars. The term diabesity was coined by Ethan Sims in 1973 to describe the relationship between Type 2 Diabetes Mellitus (T2DM) and obesity. In experiments, overfeeding young men with no previous family history of diabetes indicated signs of diabetes. Diabesity is such a serious problem. It affects more than 1 billion people in the world, including 100 million Americans and 50% over 65 years of age. I welcome and appreciate all comments, questions and or concerns, please send me an email. Please drop by again and many thanks for viewing.